Mom, where do we begin? 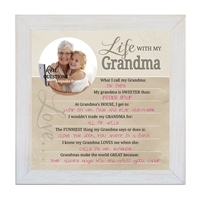 We have gifts for all stages of motherhood, frames for the first ultrasound image, to sweet handprints frames perfect for Mother's Day, to wedding day gifts that say you appreciate all she has done. There really aren't enough words for Moms, but honoring her with the way we life our life is the greatest gift of all! Love you Moms forever and ALWAYS!